Fatou Bensouda, chief prosecutor for the International Criminal Court (ICC), will deliver the annual David J. Bederman Lecture at 12:15 p.m. Wednesday, April 9 in Tull Auditorium at Emory University School of Law. Bensouda’s lecture, titled "Fostering the Promise of the Rome Statute: A Prosecutor’s Perspective,” is presented by Emory Law’s Center for International and Comparative Law. The Rome Statute is the treaty that established the International Criminal Court in 1998. Among other things, the statute sets out the crimes falling within the jurisdiction of the ICC, the rules of procedure and the mechanisms for states to cooperate with the ICC. A Q&A session and reception will follow the lecture. The symposium is free and open to the public, but attendees must register online. 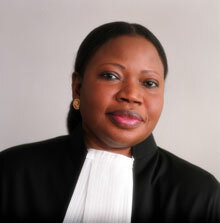 Bensouda is the first African woman to serve as a chief prosecutor for an international tribunal. Born in the Gambia, she has been the International Criminal Court’s lead prosecutor since June 2012, after having served as a deputy prosecutor in charge of the prosecutions division of the court since 2004. Bensouda was listed by Time magazine in 2012 as one of the 100 most influential people in the world, by New African magazine as one of the “Most Influential Africans,” by Foreign Policy in 2013 as one of the “Leading Global Thinkers,” and by Jeune Afrique in 2014 as one of 20 African women who, by their actions and initiatives in their respective roles, advance the African continent. The annual David J. Bederman Lecture at Emory Law was established to honor professor Bederman’s extraordinary record of scholarship, teaching and advocacy. Bederman, the K.H. Gyr Professor in Private International Law at Emory, was a noted authority on public international law, admiralty and legal history.